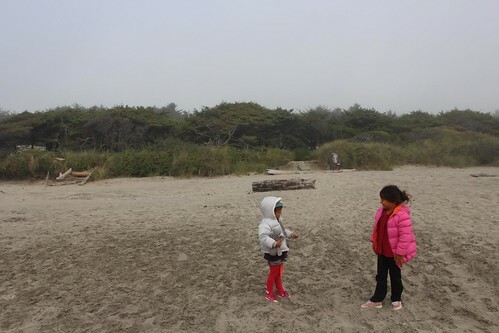 Mali Mish - Day 9: Sea Lion Caves and Beachside State Park. As much as we enjoyed Jessie Honeyman State Park, we decided to leave to head further north today. Compared to Coos Bay, the gloom that we had yesterday is mostly dissipated. 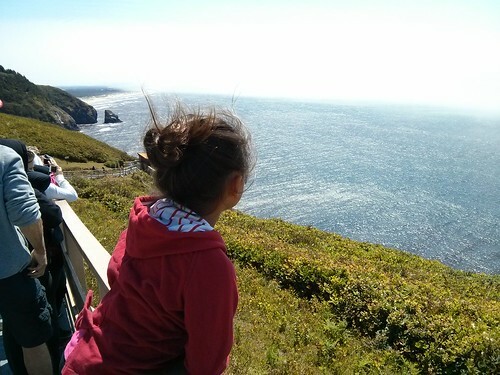 We decided to stop at a pull out along highway 1 when we saw a little place called Sea Lion Caves. It is actually kind of a tourist trap but we felt like we needed to do some sightseeing since we have been doing so much driving and not enjoying ourselves as much. 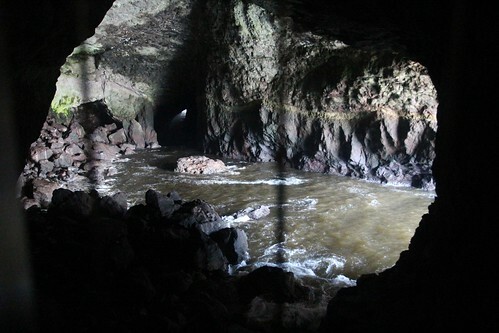 Sea Lion Caves is a self proclaimed largest sea cave in the world. I have my doubts about that claim but it is indeed a good size grotto. 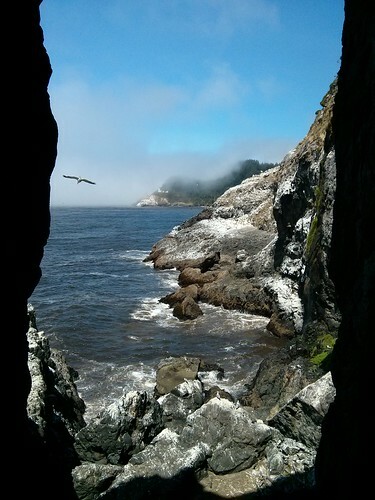 We took the elevator down to the area where we could get views inside the large cavern but all of the sea lions had left the cave for the season. This is where they would come each year to breed. The other side shows quite a stunning view of the rugged Oregon coast with several breeds of shore birds making the sea cliffs their home. We did see some sea lions at a distance out along the shore but this is the closest shot we got of them. 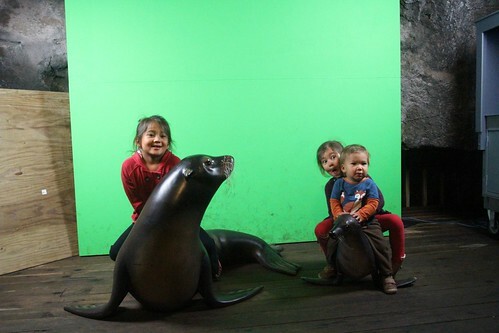 A couple were kind enough to let the kids ride on their backs and take photos in front of a green screen. Our brief stop here was a much needed break and let us all take deep breaths of the fresh and crisp ocean breezes off of the Pacific. We drove further north in search of a campground for the night. 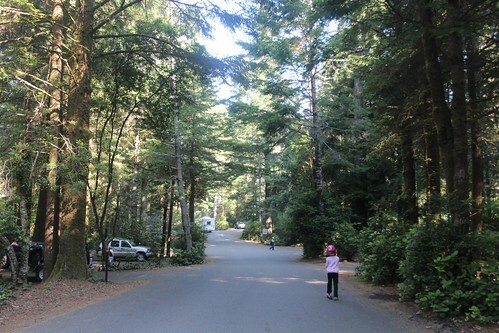 The little towns along the Oregon coast, unlike other places, do not have very many overnight parking opportunities. Since we have no reservations, we had to take our chances with the state parks during their busiest season of the year. 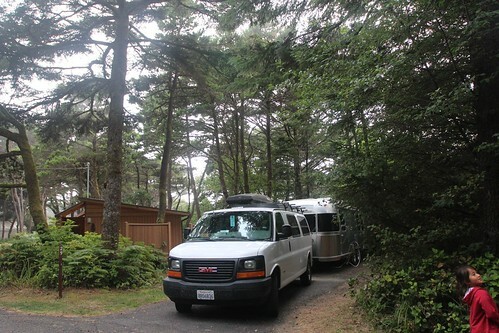 We were fortunate to get a site at Beachside State Park just south of Waldport, Oregon. We got into one of the last sites that we could fit in. In fact the ranger almost didn’t let us try backing in here after she saw how long we are. Thanks for Luka, he started to fuss and that made the ranger just wave us by. 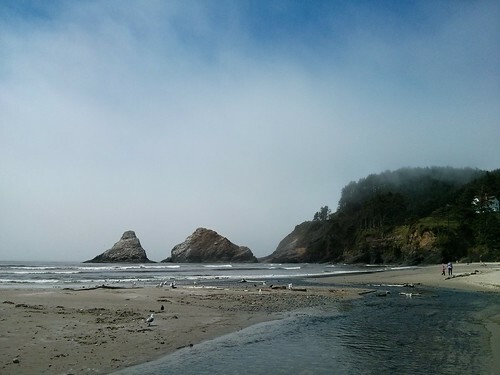 This is summer along the Oregon coast. 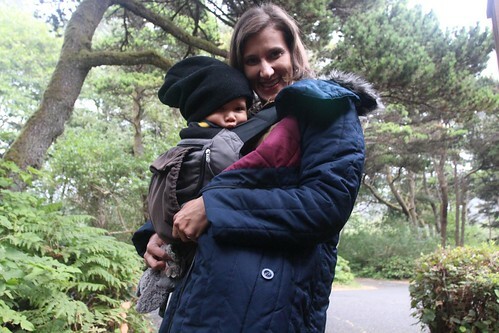 Marlene bundled up with Luka in the Ergobaby carrier before heading out to the beach. 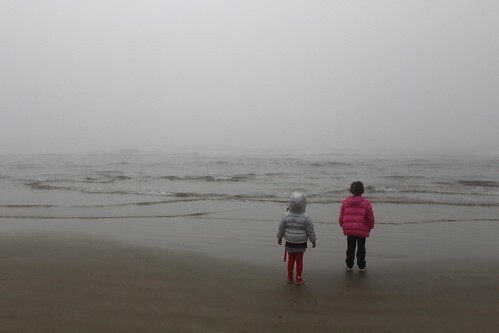 The girls stuffed themselves into their winter jackets as well and off to the beach we went. Ummm… where is the ocean? 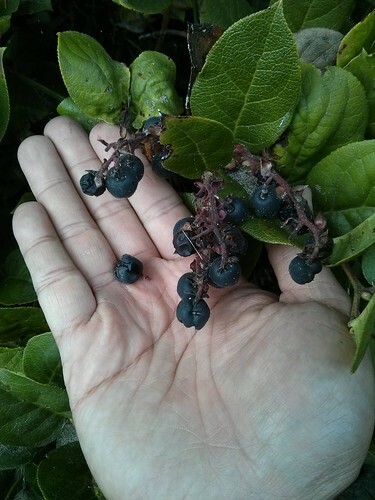 Well, at least there is plenty of berries around here to forage. We didn’t even bother unhitching as we barely fit into this spot. There isn’t really any places for us to drive to anyways so we decided to stay hitched up for when we leave in a couple of days. As a matter of fact, we have not unhitched since we left LA 8 days ago. Hey little man! 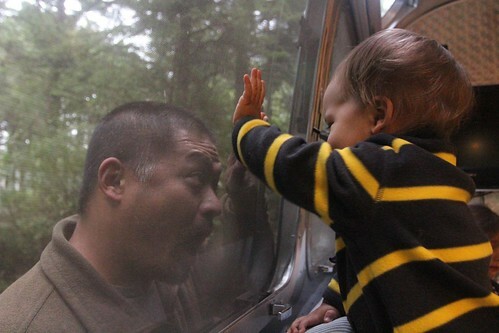 High five! We are in Oregon! I promise we will find sunshine soon! 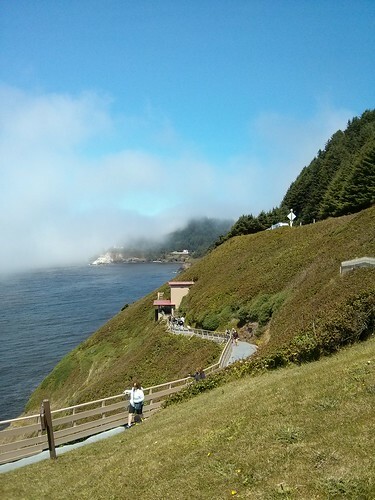 3 Responses to Day 8: Sea Lion Caves and Beachside State Park. 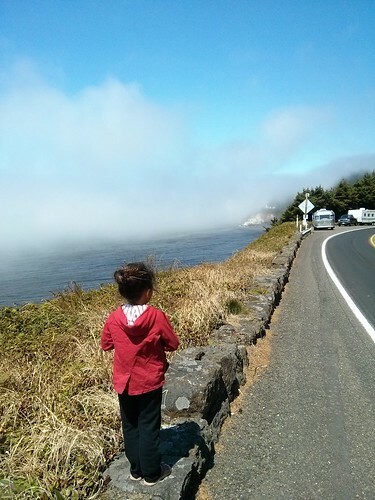 That Oregon coast is my favorite place to take the old Airstream motor home on vacation. What is happening to the Airstream blogs? 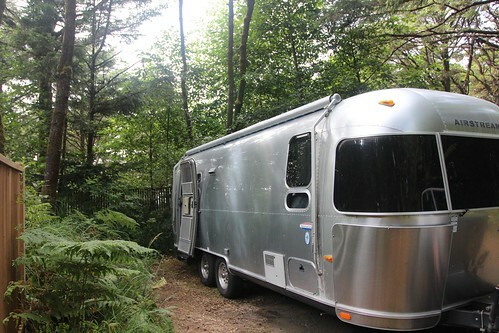 No updates here in two months, glamper has gone private, Silver Snail went silent for the better part of a year and has only just started up again, is there something going on in the Airstream community? Definitely feels like some kind of conspiracy theory going on 🙂 Although we have no excuse except to say that we have expended most of our social network energy on Instagram lately. Actually I am working on catching up as we speak. Should have a couple of posts up by tomorrow 🙂 Let’s hope I can keep it up and catch up to date before 2014.